18 years on and the band is reforming! One of the joys of teaching is to see the children you taught grow up and to listen to them reminiscing together about the things they remember about school. About 18 years ago, this fantastic group of kids used to play in our then renowned steel band. I’m so excited that we’ve managed to get most of this particular group back together to form our new Provo Primary and Middle School Alumni Band. I can’t wait for us to start performing again! This past term in our music classes, we studied various styles of music such as Jazz, Blues and Reggae. As part of their learning, the children did an in depth study of Somewhere Over the Rainbow in the style of Israel Kamakawaiwo’ole, and learned about the major and minor chord progressions and to play a reggae style beat. The children worked really hard to perfect this piece on the steel drums and keyboard to play for their graduation ceremony. Children, parents and visitors enjoyed a selection of music on our steel drums this afternoon, played by our Junior and Senior Bands and our Year 5/6 class. We hope you enjoy the movie above of our Senior Band performing a Christmas medley. You sound great guys! If you would like to hear more, the children will be playing at the TCFAF Christmas Party on Saturday at Brayton Hall at 3:00 PM. We hope to see you there! Our beginner guitarist and talented steel drum players entertained everyone at the end of the day with a festive concert. 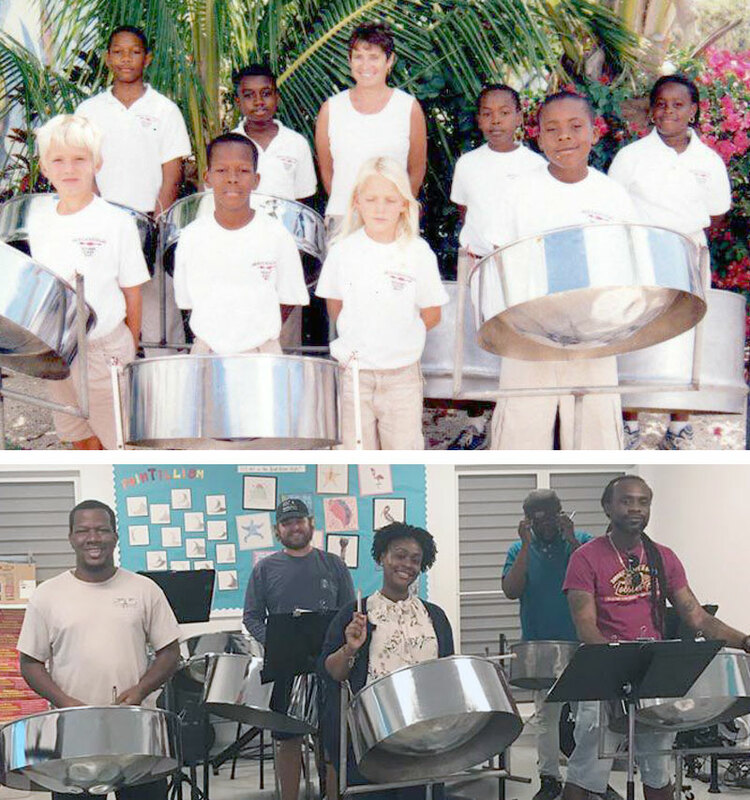 Good luck to our steel band, along with our many dancers, who will be performing at the Turks and Caicos Friends of the Arts Foundation (TCFAF) Christmas Concert on Saturday. School ended with a swing today, with an amazing performance by our Steel Drum Band. They wowed everyone with their performances of “Don’t Worry” by Bob Marley, “In the Mood” by Glen Miller, and “Wipeout” by The Surfaris. Our 7 year old drummer, mesmerized the crowd with his drum solos and the steel drummers, all aged between 8 and 10 played their hearts out. With the audience clapping, cheering, dancing and singing along – it was fantastic way to see out the Spring term. Steel Drum teacher, Brentford Handfield, was very pleased with the children’s performance and has been amazed at how quickly the children have learned new songs he has introduced this term. Next term, we look forward to hear more new songs, building up to performances on the beach at the annual Fool’s Regatta and on the stage at our End of Year Assembly. Click on to see a video of ‘In the Mood”. It was another exciting day of sailing and beach fun at the 20th Annual Fools’ Regatta. A great community event with proceeds from this year’s event going to the Turks and Caicos Islands Football Association Youth Programme. Our Steel Band entertained the crowds with the Caribbean sounds of the steel drums. It was a first community performance for some of the children although the school band has participated for over 10 years. Everyone did really well and enjoyed playing on the beach. The Great Raft Race was a highlight for many, with Provo Primary entering 2 rafts. The ‘Dragons’ and ‘Poseidon’s Vessel’. Spirits were high and everyone rowed their hardest in the gusty winds and choppy waves. We once again we won the Vindaloo Cup for best overall team spirit and design. Great participation, well done everyone! A big thank you to the raft team mentors for coaching and guiding the teams through the raft building process, sourcing materials, and their much needed technical support. Also to everyone who helped transport the steel drums to and from the event. We are excited to announce that we have 3 new ‘Jumbie Jam’ pans to add to our steel drum set. These were purchased through various steel pan fundraising events and arrived on island with David Gettes, our steel drum tuner, last week. The Jumbie Jams are superb beginner steel drums, with a really high quality sound, and they are a fantastic addition to our already established steel band. All the children have been extremely keen to come into the Music Room to try them out and they are a perfect size for the younger children in the school to play and learn on. They look like great fun too with their feet stands and bright colours. Apart from the blue colour that we presently have, they also come in flamingo PINK! It’s been particularly great to see our older steel drum players taking on the role of mentor, teaching the younger children how to play. Our Steel Drums Sound Sweet Again! If you were not aware, our steel drums have been in need of tuning for some time and David Gettes has been down this week from Philadelphia to tune them for us. David learned to play and tune steel drums with some of the best tuners in Trinidad. He is an excellent steel pan performer and tuner! During his time here, David has also worked with some of the steel band members, helping them to develop their playing technique. He also did a presentation to the children, talking about the history of steel drums and answering the multitude of questions that the children wanted to ask. We have a great band this year of young players who are well on their way to being ready to play out in the community on the newly tuned drums. Listen out for us at the annual Fools’ Regatta in June, if not before! Play the Steel Drums Online! Our Junior and Senior Band entertained the crowd at the Fool’s Regatta with the caribbean sounds of the steel drums. This was the first public performance for the Junior Band, who have only just started playing together this term. As always, we were very happy to play at this annual community event and have been doing so for over 13 years. Grade Four love playing the steel drums during their music lessons. They have learnt the names and roles of the different drums, as well as memorizing some of the chords which they have to play. Steel Band Records Their First CD! Provo Primary Steel Pan Performance a ROARING Success! Last Friday night saw a number of visitors come to the school including a steel pan playing lion. All was going well until the lion chased away the drummer. Fortunately, there was another one in the house and the show was able to continue! David Gettes, steel pan builder, tuner and performer is coming to Provo on November 19th. During his visit, David will be tuning Provo Primary Schoolâ€™s steel drums and working with groups of children from the school, showing them a little about tuning and developing their playing technique. David will also be performing at various places around town during his short stay. He will be playing at Iguanas restaurant on Monday 20th November and at Providenciales Primary School on Friday 24th November. The Friday performance will be specifically for children and will involve a story telling session in addition to steel pan performances. Providenciales Primary School Senior Steel Band are tuning up and raring to go!. After only two music lessons this term, the children in Provo Primary School Senior Steel Band are already playing three songs: Calypso Warm Up, Jamaica Farewell and Matilda. These young musicians are taking it very seriously this year and I have no doubt that they will be out in the community playing in no time. If you happen to enter the school during recess times, you may hear them practising in their spare time and WOW do they sound good!! !